Naomi Campbell is wearing a black floor length gown by Alexander McQueen. What do you think of this look? Is it a yay or a nay? I am a lover of the finest things in life and this is one of them. 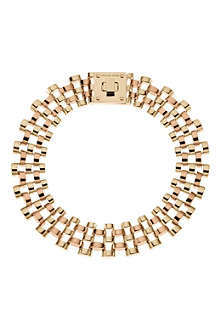 This watch-link necklace is by Michael Kors and it is a statement piece. This gold-toned piece will look amazing when worn with a special evening dress to a very special place. It currently costs £329 at Selfridges so feel free to splurge or just add it to your wish list.